RICHMOND, Ky. – Former Eastern Kentucky University men’s golfer Mike Whitson was selected as the new EKU women’s golf head coach, Director of Athletics Mark Sandy announced today. Whitson was a four-year letterwinner for the Colonels from 1994 to 1998, helping the team to a second-place Ohio Valley Conference finish and capturing All-OVC honors in 1998. 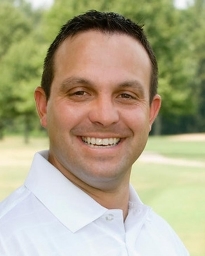 He will begin his duties as EKU’s third women’s golf head coach on August 23. The Paris, Ky., native has spent the past five years as the head women’s golf coach at Indiana State University. Whitson was hired in 2005 and charged with restarting the women’s program after a 28-year hiatus. His first Sycamore team (2006-07) placed eighth among 10 teams in the 2007 Missouri Valley Conference tournament. By 2009, Whitson had his squad up to sixth. This past season, ISU turned in its best performance, a third place finish. In four seasons of competition, he coached four All-MVC selections. In addition to their success on the links, Whitson’s student-athletes have excelled in the classroom. In July the Sycamores were listed fourth on the National Golf Coaches Association’s (NGCA) top-25 list of team grade point averages. Whitson’s squad had the highest team GPA among NCAA Division I institutions. Three Sycamores were selected to the NGCA All-American Scholar Team for Division I. In four seasons Whitson coached 17 NGCA All-American Scholar Team selections, including five each in 2006-07 and 2007-08. Whitson spent three seasons (2001-04) as an assistant women’s golf coach at the University of Tennessee. He helped UT advance to the NCAA tournament each season, including the NCAA Championships during the spring of 2004 where the team placed 11th. The 2002-03 regular season also saw great success as the Lady Vols set a school record by winning three tournament titles, including the Lady Boilermaker Invitational, the Auburn Tiger Derby, and the Lady Kat Invitational. Tennessee was a regular in the top 10 nationally during Whitson’s tenure at UT, and reached as high as No. 2 in the NGCA Division I Coaches poll. He also coached three All-Americans, three Academic All-Americans, and three future LPGA Tour members; Jessica Shepley, Young-A Yang and Violeta Retamoza. Whitson’s collegiate coaching career began at Transylvania University in Lexington, Ky. In 2000-01, his only season at the school, Whitson led the women’s golf team to a No. 16 ranking in the National Association of Intercollegiate Athletics (NAIA). He guided the team to a first-place finish and three second-place performances. In addition, he coached sophomore Catherine Benson to a third-place finish at the NAIA Nationals, earning her All-America honors. As a senior in 1998, Whitson fired a second round score of 64 at the OVC tournament. He finished tied for third with a three-round total of 214, two shots under par. During his collegiate career Whitson also served as the president of the Student-Athlete Advisory Committee. As an amateur, he won the Michelob Classic in May 1997 and the Club Car Classic in May 1998. He was also runner-up at the Kentucky State Amateur Championship in 1997 and 1998. After concluding his collegiate career, Whitson played on a number of professional golf tours, including the Hooters Tour, Central Florida Tour and Development Players Tour. As a pro, he claimed the 1998 Owensboro Open title and finished among the top 10 in five other events. Whitson earned a bachelor’s degree in physical education from EKU in 1998. He completed a master’s degree in education with an emphasis in athletic administration at the University of Kansas in 2005. Whitson becomes the third women’s golf coach since the program began in 1993. Sandra Martin led the Colonels from 1993 to 1998, and Joni Stephens served as head coach from 1998 to 2010. Share your thoughts on the hiring at the Maroon Nation forum.